Young activists at a ‘weekly Marxist gathering’ organized by the Communist Union of Donbass in Donetsk. Last month, I made a whirlwind visit to seven cities in four countries of the former Soviet Union: Russia, the Donetsk and Lugansk People’s Republics, and Moldova. The trip was based around an invitation to the International Action Center to participate in an International Antifascist Conference in Lugansk on May 7 and 8. The reason I crammed so much more into a two-week trip will hopefully become apparent. I could easily give a whole presentation on the war situation in Donetsk and Lugansk, but what I especially want to bring to your attention tonight are the important developments on the revolutionary left in that part of the world. Recently Workers World published an article from a correspondent in Europe about the latest U.S.-NATO escalation: the stationing of so-called missile defense weapons in Romania and Poland, along with an associated radar system in Turkey. These are actually first-strike weapons aimed at Russia, much like the Star Wars program proposed back in the 1980s under the Reagan administration during the Cold War against the USSR. The comparison is important, because this is, I believe, one of the biggest military escalations by NATO in the region since the Reagan era. It’s certainly viewed that way in Russia and Donbass, especially coming on the heels of two years of increasing NATO troop strength and ever-bigger and more provocative war games in Eastern Europe. One thing I heard repeatedly during my visit was that World War III has already begun, and the first front is the U.S.-backed Ukrainian war on Donbass. Without trying to take away for a moment from the critical struggles unfolding right now in the Middle East, Latin America, Asia and the Pacific, and Africa, I’m not convinced that we are fully aware or prepared for the severity of the war danger that’s unfolding on the periphery of the former Soviet Union. Certainly, the antiwar and radical movements in this country are not. That’s the bad news. The good news is that there is a young, dynamic, revolutionary left emerging in the former Soviet Union. Investigating this was my underlying motive for visiting so many places, and confirmed my impression that this is a real development. This emerging, new revolutionary left is rooted in youth and young adults under the age of 35 — people who came into political life, and many who were even born after, the destruction of the Soviet Union and the restoration of capitalism roughly 25 years ago. Of course, there are also the best communist elements of the older generations who lived through the era of socialist construction. This is especially evident in Donbass, a center of miners and metalworkers, where socialist and anti-fascist traditions stayed strong even after the fall of the USSR. A new survey confirms what several other polls taken over the past decade showed: that a majority of residents of the former USSR want to restore the union and the socialist system. But as a comrade from Lugansk once explained to me, a genuine revolutionary movement today has to be based on those who have come up under the experience of capitalist exploitation, not on nostalgia for the past. And that’s what makes this development so exciting. 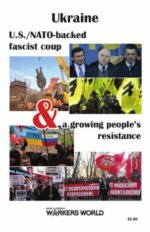 Our Party is in a unique position, compared to most of the Western left, to bear witness and also develop strong political and working relationships with this new movement through our work in solidarity with the Donbass struggle and the anti-fascist resistance inside Ukraine. A lot of it, frankly, is because of our fortuitous forging of a strong comradely bond with the Ukrainian Marxist organization Borotba, starting in the winter of 2014, shortly after the U.S.-backed coup in Kiev. Because of the Party’s consistent work around the struggle in Ukraine and Donbass, and most of all because of Borotba’s unique history as an organization uniting revolutionaries from many different traditions, we have had a door opened for us to meet and get to know many of these forces, including but, not limited to the United Communist Party, the Center for Antifascist Resistance and the New Communist Movement in Russia; the Communist Union of Donbass, the Workers’ Party of Donbass, and the Union of Left Forces in Donetsk; the Lugansk Communists, Ghost Brigade and InterUnit in Lugansk; the Red Bloc in Moldova and the Communist Party of Transnistria. All of these forces have their own unique histories. Some emerged completely from post-Soviet communist movements, others, like in Lugansk, have long historical ties going back to Soviet times. All of them are struggling to navigate the unique historical situation they find themselves in, trying to build a new communist movement on the ruins that capitalism has made of Soviet achievements. What should be preserved of that period, and what needs to be new and different? The emergence of a new communist left isn’t limited to the areas I visited. We are starting to learn about similar developments in Kazakhstan, Georgia, Latvia and Eastern European countries like Poland and Bulgaria as well. I want to bring special attention to the importance of the internationalist fighters who have come to support the Donbass resistance, many of whom have gravitated to Prizrak or Ghost Brigade, founded by the late Commander Alexei Mozgovoi. The Ghosts include communist militants from many countries. They and the leadership of the brigade share a perspective that this military experience is crucial for the struggles that lie ahead – not only in Donbass and Ukraine, but in the global struggle to abolish capitalism. Regardless of who is elected to head the imperialist regime in Washington this November, and no matter what accommodations the capitalist rulers of Russia may try to make to the West, the U.S. is determined to carve up Russia and turn it into the neoliberal colony they’ve been working toward for the last quarter century. As we rise to meet the challenge of stopping new wars, it is a very hopeful development that there are new allies and comrades we can depend on to join us in that struggle. From a talk given to a Workers World Party forum in New York City on June 3, 2016.